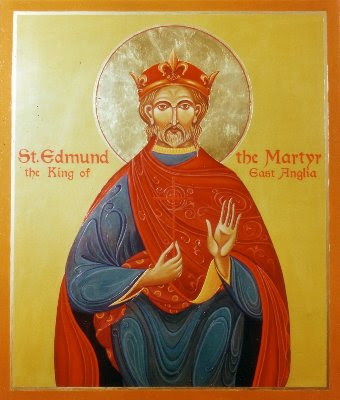 Saint Edmund was born in 841. Early accounts and stories provide a cloud over who is his father. 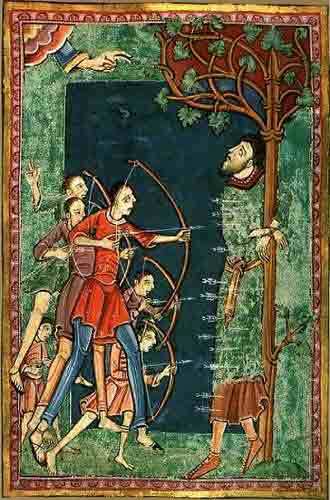 The sources considered the most reliable represent Edmund as descended from the preceding kings of East Anglia. When King Ethelweard died in 854, it was Edmund, while only fourteen years old, who succeeded to the throne. Little is known of Edmund’s next fourteen years. His reign was said to be that of a model king. He was said to have treated all with equal justice and was unbending to flatteries. He was said to have spent a year at his residence at Hunstanton learning the Psalter which he was able to recite from memory. The sources describing his martyrdom vary. The Danes of the Great Heathen Army advanced on East Anglia in 869 and were confronted by King Edmund and his army. 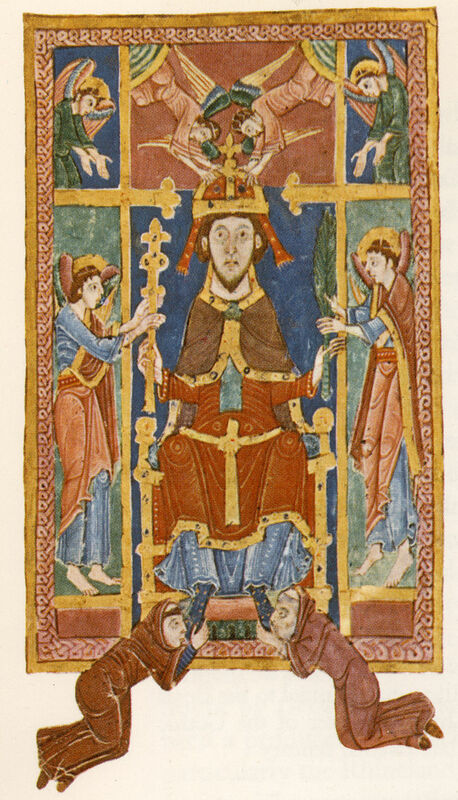 While Edmund may have been killed in battle, popular traditions are that Edmund refused the heathen Danes’ demands that he renounce Christ or that he could hold his kingdom as a vassal under heathen overlords. Both stories date from soon after his death and it is not known which may be correct. 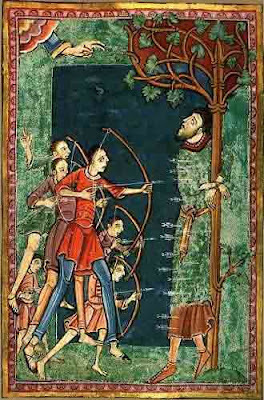 According to an early biographer, Abbo of Fleury, Edmund chose, in the manner of Christ, not to strike arms with the heathen Danes and was captured and taken to Hoxne in Suffolk. There he was beaten and then tied to a stout tree where he was again beaten. 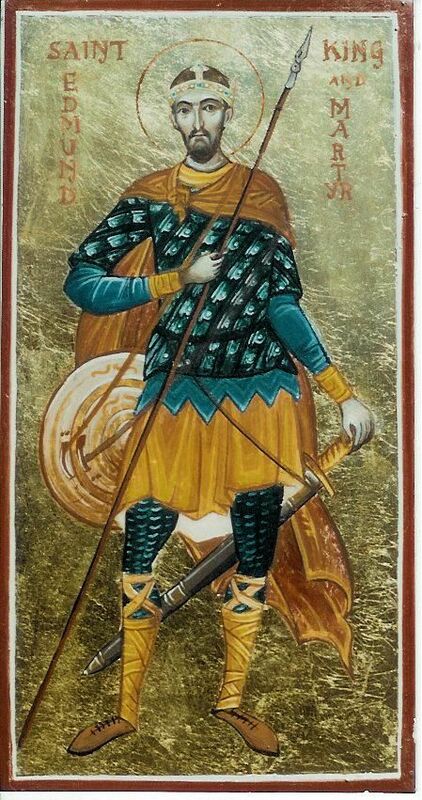 Hearing Edmund’s calls to Christ for courage, the Danes further attacked him, shooting many arrows into the bound king who showed no desire to renounce Christ. Finally, he was beheaded on November 20, 869. Edmund’s body was interred at Beadoriceworth, the modern Bury St Edmunds. This place became a shrine of Edmund that greatly increased his fame. His popularity among the nobility of England grew and lasted. His banner became a symbol among the Anglo-Normans in their expeditions to Ireland and to Caerlaverock Castle. His crest was borne on a banner at the Battle of Agincourt. Churches and colleges throughout England have been named after Saint Edmund. 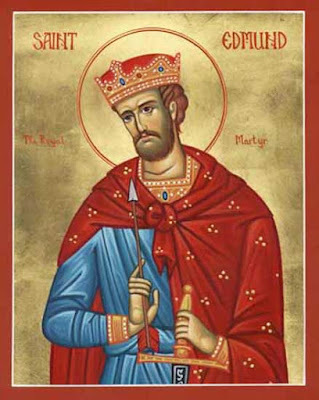 In recent years, moves were made in England to restore Saint Edmund as the patron saint of England. 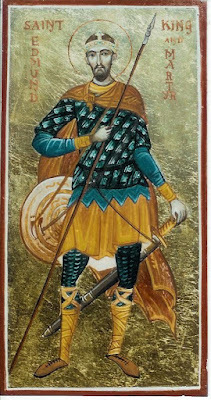 Edmund had been replaced by Saint George as the patron saint through King Edward III’s association of Saint George with the Order of the Garter. The attempt failed. 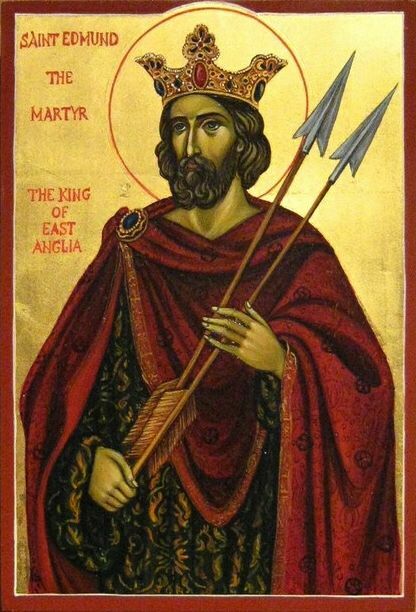 However, Saint Edmund was named the patron saint of the County of Suffolk in 2006.